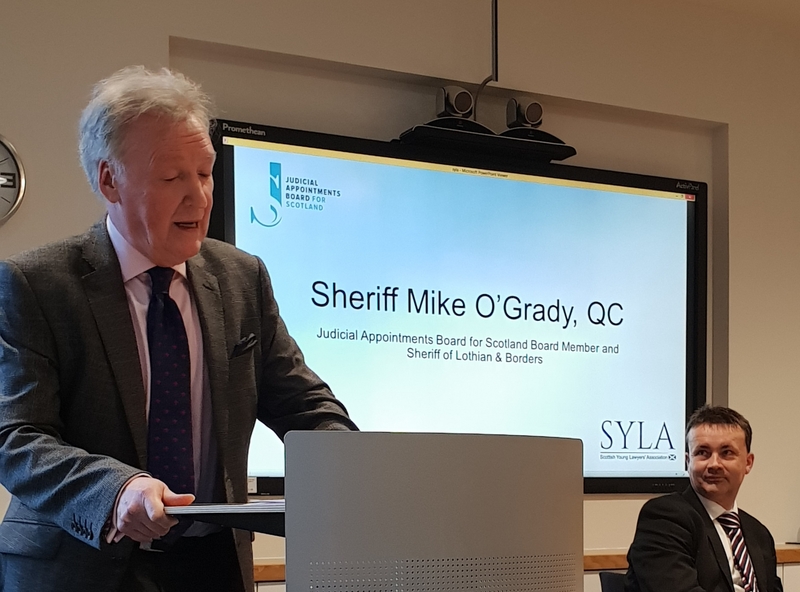 The Judicial Appointments Board for Scotland were delighted to join with the Scottish Young Lawyers’ Association last week to co-host the “So you want to be… a judge?” event. The Board would like to express their gratitude to Mrs Anne Scott, Tax Chamber President, along with Summary Sheriff Adrian Cottam and Board Member, Sheriff Mike O’Grady QC for braving Storm Ali and spending the evening speaking about their wide and varied judicial career paths and for taking questions from the assembled lawyers. Despite Storm Ali’s best efforts we were fortunate to have a great turn out on the night. A warm thank you is extended to everyone who braved the weather and we sincerely hope that the speaker’s insights into their judicial life has ignited a spark for you. It can safely be said that the event was a success, however the Board always welcomes feedback. If you have anything to say then please let us know by using our contact from. Please keep an eye on our twitter (@JudgeAppts) feed and website where all future events will be highlighted.